If the ovaries produce too much androgen (hormones such as testosterone), a woman may develop male characteristics. 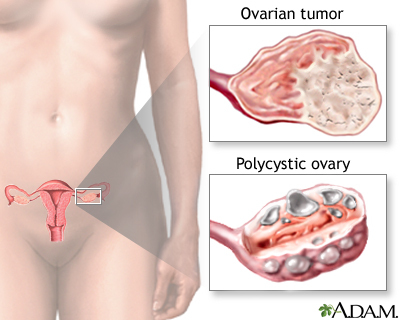 This ovarian imbalance can be caused by tumors in the ovaries or adrenal glands, or by polycystic ovarian syndrome. Hyperandrogenism may include growth of excess body and facial hair, acne, amenorrhea (loss of menstrual periods), and changes in body shape. Virilization can occur with ovarian and adrenal tumors and includes deepening of the voice, male pattern balding, and increased muscle mass.